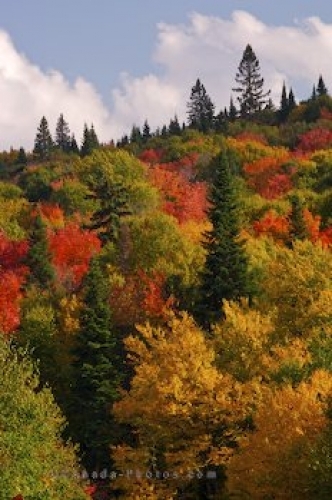 Tourists traveling through Parc national du Mont Tremblant in Quebec, Canada will find the vibrant trees extremely colorful as Autumn is in full swing. The trees on the mountain slopes display an assortment of reds, greens, yellows and oranges as they prepare themselves for the cold winter months which lie ahead. The park covers an area of 1,510.1 sq kilometers where tourists will find hundreds of lakes, streams, waterfalls, rivers and a variety of wildlife. As the colorful Autumn trees alter their appearance, so do many of the animals as they need to camouflage themselves as the seasons change. Picture of the colorful Autumn trees in Parc national du Mont Tremblant in Quebec, Canada.